In this book the author has avoided a long more or less theoretical introduction, developing the subject as logically as possible from the descriptive and experimental side; each law and theory has been presented at the point which seems best fitted both to the student and to the subject. This volume is the second of a three part series of texts taken during a first-year university course. Tutorial questions with fully worked solutions structured on a weekly basis to help the students to self-pace themselves are used. 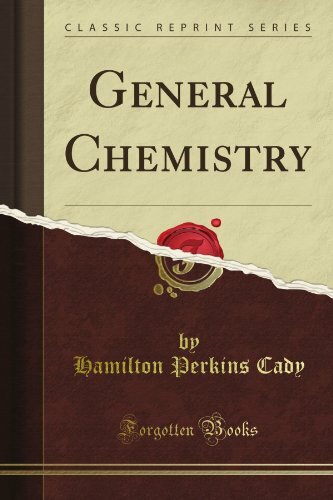 This book is about fundamental concepts that any chemistry student should not only be aware of but proficient at. It deals with the states of matter, the mole, the shapes of molecules, the elements and their properties in the periodic table, etc. A brief introduction to the fundamentals of chemistry. The textbook is designed to introduce chemistry to students who will take only one chemistry course in their academic career. Certain chemistry topics are covered in a generalized manner. Atoms, chemical bonds and chemical compounds, chemical reaction kinetics, chemical equilibria, acid and base theory and electrochemistry -- all of this is presented to help students get a solid understanding of fundamental and applied chemistry.